1. 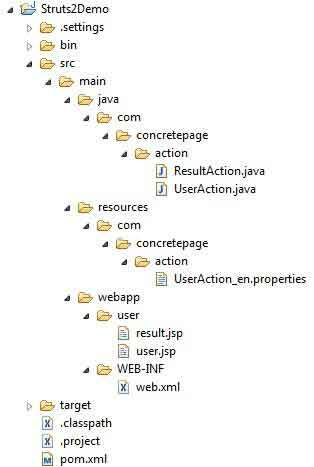 Create a property file for any specific action class like UserAction_en.properties where UserAction is an action class and en denotes for default or English specific locale. 2. Use keys to define messages and label name in JSP and action class. I have used some keys and values in our sample Message Resource property file. user.name.req = Enter your Name. user.email.valid = Enter a valid e-mail address. In the action class we are using keys to provide the validation message. This JSP is a simple User form. Every input field contains key attribute that will pick label name from Message Resource file. 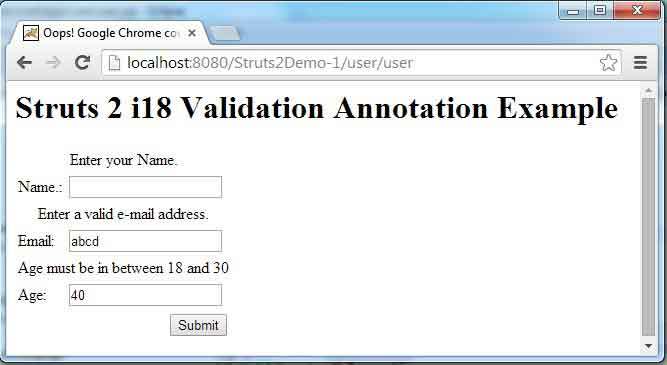 Find the eclipse structure for annotation based struts 2 example using message resource. Run example by http://localhost:8080/Struts2Demo-1/user/user and test it.